He is smart, really! Steve Oliver has opened the wide world of keyboards sound to the guitar. With his NS1 (Nylon Synth) and the SH575 guitars in connection with the Roland (Boss) GR-33 guitar synthesizer he rules the stage. A thankful audience and fan base since several years is the result. He has already several albums to his credit. First View (1999), Positive Energy (2002), 3D (2004), Radiant (2006), Snowfall (2006) and the DVD/CD feature One Night Live (2008) are to mention. 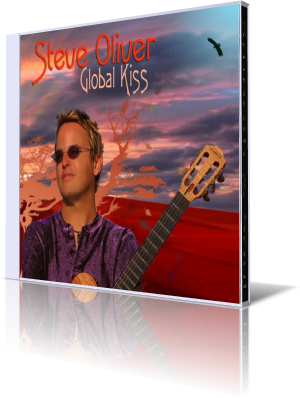 His new album is entitled Global Kiss and released by Oliver's own label SOM Entertainment. Steve is joined on his new album by some of his earlier label mates like Darren Rahn, Nate Harasim, Will Donato or Alan Hewitt, members of Spyro Gyra like Tom Schuman and Boney B. and further top cats of the scene like Mel Brown, Larry Antonino, Humberto Vela, Bob Baldwin, Marion Meadows and more. It looks like the time of cover albums is over. Steve has written all songs on his new CD. The starting tune Fun In The Sun describes his attitude of pure happiness. His nylon guitar sounds better than ever and his humming didn't loose its charm. Nate Harasim underlines the song with some tricky sounds, while Darren Rahn fills the air with his mesmerizing sax. Come with me on the journey around the world and have the Global Kiss. Steve Oliver showcases his knowledge and mastery of Roland's great sounds. Someone told me that triggering comes from tricks. Steve offers some oriental sound, Spanish castanets and more of this stuff, we combine with the rest of the world. Long Road reveals Steve's romantic vein. His guitar licks are echoed by Will Donato on sax. Nate Harasim adds some modern sounds and rhythms. With Barcelo we breath more of the Spanish air. After Nate's fiercely Salsa piano interlude Steve brings the song to an incredible summit. Do you remember Chips and Salsa? Then you know the direction. Steve's voice is remarkable and he should make a greater use of it. Life Goes On opens your ears. Perhaps Steven could be a great country music star, if his heart wouldn't beat for the smooth jazz. This is obvious. Just listen to Ba Aye for example. Steve has a special technique to let the guitar flow with the rhythm. Tom Schuman peppers it up with a short piano solo. The Spanish school of guitar playing has a strong influence on many contemporary jazz guitarists. Marc Antoine, Richard Smith, Dirk Kay or Peter White are some of these adepts. Steve Oliver performs this influence on Sunlight Within with an outburst of joy. On the waving Fearless Oliver presents his second vocal song. In addition to his live version on One Night Live he features Steve Madaio on trumpet. The interlude Another Place gives a glimpse at Steve's classic education. Fortunately Steve doesn't serve too much of his earlier style, but creates tunes like True Vision with a Caribbean flavor. Yes, the world is full of new ideas. There is also a place for laid-back listening. Take Me Away impresses with a captivating melody. Oh yes, that sounds pretty good. I love these harmonies and the African percussion by Humberto Vela. Angel Amore has a celestial touch. Great guitar performance. Since a long time Steve Oliver is in my focus and with great pleasure I observe a guitarist, who develops his potential from a technical expert and virtuoso to a shining star.